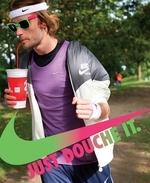 No, this is not a real Nike ad. It's all part of a promotion for an international magazine. Our tipster tells us, "We prefer to keep the publication anonymous for now but this will be going to print in the very near future and we expect it to provoke some discussion and probably some threats of legal action." Just Douche It? That ain't goin' over well with Nike Oregonians.